Know your body – if the trend doesn’t flatter your shape, then it’s not your friend. Wait around for next season when something less awful is popular. Does the item look cheap? It’s easiest to make black clothes look expensive. If you are considering a cape (like I am!) consider it in a classic color like black or camel. Can you honor the trend with an accessory? While the summer scarves drove you crazy, they are a cheap and easy way to stay on trend. If the foundation of your outfit is classic, you can pimp it out with less expensive accessories. Cheap satin will always look cheap. Animal prints only look luxe if they are applied to a quality fabric and/or a classic shape. 70% of your wardrobe budget should go toward long-term investment items (which doesn’t mean they are expensive – it just means that they will survive being washed and worn for at least 3 years) and 30% can go toward trendy stuff. Does the trend speak to you? Did they read your mind and invent the thing you’ve been craving all along, even if it’s only going to be around one season? go for it! Morgan has several fashion luxuries. She’s young (<30), lives in a warm climate, and works in a creative field. I live in Seattle, where the biggest trend is Northface jackets and shoes from The Walking Store. Morgan has it made from a fashion perspective. Morgan could totally rock the 60s vibe. 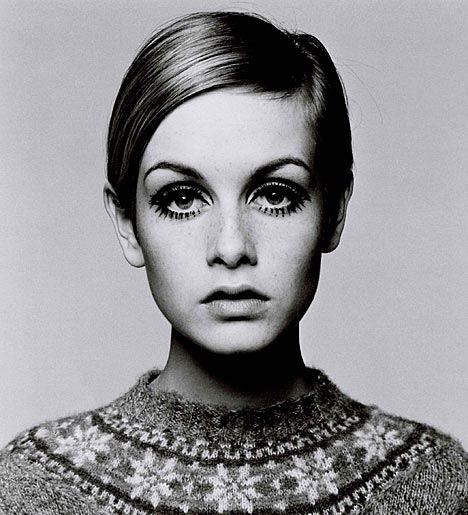 Morgan's face frame is perfect for pulling of dramatic lashes, Twiggy style. I have been salivating over this dress from BCBG since the first time I saw it. I can't wear it, but Morgan can. I know you like "da club" which is too casual for this in San Diego, but you would KILL in this dress! Here’s a roundup of trends that I cannot abide. don't wear any of these under any circumstances. Thanks! If you get that dress, an angel will get its wings. It would look AMAZING on you! I saw that on pinterest… I think it’s certainly interesting (and with your passion for writing, you could do something fun by picking specific words or something) that said, I think the color combination could look dingy… is there a way to do it with a blushing pink? I happen to have long nail beds that sometimes produce eerily long and perfectly formed nails with very little effort. I went through a period several years ago where I would paint them cherry red and apply gold applique stars on them. Then I’d put on the shiniest slickest top coat I could find. I felt like a cross between Mandy Moore and Mary J. Blige. It was awesome, and I was certain that it my nails upped the anti for my seshual appeal. So, in summary: I think that the grey/beige combo could give you a case of the zombie fingers, but the idea of it is kind of fun. If you can experiment with it and prove that it can be done with more complexion-friendly colors, I’d love to see the result! I’m pretty sure you can use any color, as long as it’s light enough. It’s pulling the ink off the newspaper onto your nail, so as long as the black ink comes through it should be fine. Amirite? It looks pretty sweet if I say so myself. Ok – let’s try this this weekend. I’m in if you guys are. Where on earth will I find a newspaper? Too bad I can’t get this to work by holding my fingers next my monitor while I read HuffPo! Crap, I missed this response and I just cut my nails. But I promise I will try to soon! it’s never too late! My biggest obstacle has been finding a newspaper. Those things are pretty rare these days. I wonder if I can use any printed page? Think the free paper. Like The Reader! wow, your roundup of hideous trends, not only brought me to tears from laughing but is also spot on! =) love it! and this post addresses perfectly the big question I’ve been asking myself for the last year or so. Flattery gets you absolutely everywhere. Love it. But you’ve given us a cliff hanger – what trend are you thinking of investing in?? ?